Binocular Eye Shields - Do they really work? Binocular Eye Shields: A Product Whose Time Has Come? How did we learn about binocular eye shields? While visiting with the representatives of the various binocular companies at the 2012 Shot Show, we happened by the Field Optics Research booth and were intrigued by several innovative products for binoculars which they were demonstrating. The first one was the binocular eye shields . When we stopped to look, they pressed a free "EyeShield" sample into our hands. What is the EyeShield, Anyway? We first slipped a pair of the EyeShields onto a binocular and took it, along with another comparable instrument for comparisons, out to see how they worked in the field. We confess up front that we tend to be a bit "old school" when it comes to binoculars. We find we're able to enjoy Porro prisms as well as "roofies," for example, or open-bridge style binoculars as easily as those that aren't. We don't expect to be taken in by most add-on products and, generally speaking, we're pretty much able to resist them. We tip our hats to those products that actually get us to use them. We were, however, quite favorably impressed with the EyeShield products. As advertised, they reduced the glare on ocular lenses caused by light coming from the side. They also made it much easier to focus intently on the view. Perhaps it was only psychological, but we thought the view seemed more intense with the EyeShield than without. They also block out the weather! If you've ever been out looking at animals in wind, rain, snow, or dusty conditions, you'll likely have vivid memories of how "comfortable" it is to use binoculars in those circumstances. The EyeShield blocks most, if not all, of the discomfort in those situations, too. Very nice and well worth it for this benefit alone if you often find yourself in such conditions! We've said quite a few positive things about them, what are the negatives? Well, unfortunately, we don't see that the EyeShield will be of much benefit to those who use eyeglasses. That's simply because the EyeShields are able to shut out side light because they conform closely to the side of the face. Eyeglass frames simply don't come close enough to the side of the face for most of us to be able to wear glasses while using EyeShields. The OpticsReviewer team members who tried using the EyeShields while wearing eyeglasses found that the eyeglasses held the shields out and away from the face and making them of little benefit. If you're not wearing eyeglasses, they're great. With eyeglasses, not so great. When taken out of the metal box they come in, they feel like a premium quality rubber product to the touch. When one of the OpticsReviewer team needed to replace some rubber parts on a nearly 20 year old Mercedes Benz diesel automobile, he was impressed with the feel of the new parts and the fact that the original parts had lasted so long despite daily exposure to the elements. He felt that the rubber used for the EyeShield products had a similar feel. We thought that was interesting and wondered if the EyeShield would be similarly durable. In putting them on a binocular's eyecups, we soon realized that the rubber ring had enough give to adjust to most eyecup sizes in its category, but was snug enough and had enough "grip" and friction to not come away from the eyecup easily. 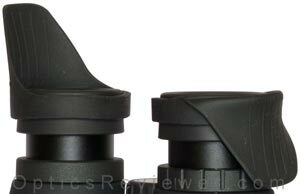 The Field Optics Research folks say the standard size fits eyecups with an outside diameter of 1.45 to 1.75 inches. 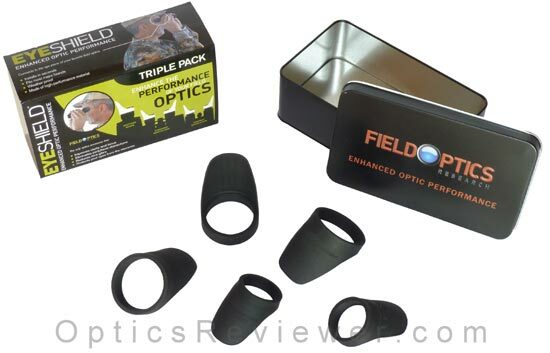 The compact size fits from 1.1 to 1.46 inches and the single spotting scope shield fits the same sizes. In using them with twist-up&sol;twist-down eyecups, we found that we liked to twist up the eyecup and position the EyeShade on top of it so it would be in the right position with the eyecup extended. Because we put some side-pressure on the eyecup during the installation process, we twisted it back down before pulling the EyeShield's base ring down evenly around the eyecup. It went on easily and without fuss. When sharing your binocular with friends wearing eyeglasses or when you're ready to put it in its case, just flip the EyeShields down to the sides. It's an easy and effective design feature that makes them especially user-friendly. The more we use them, the more we like them — especially on sunny days! In the United States, we've not found anyone to consistently beat Amazon's price and they carry both the compact size EyeShields for 1.10 to 1.46 inches (27.94mm to 37.08mm) eyecup diameters and standard size EyeShields for eyecup diameters of 1.45 to 1.75 inches (36.83mm to 44.45mm). You may be thinking that the concept is great and maybe the products are durably made, but if they just slip onto the binocular's eyecups doesn't that mean they can slip off easily, too? What if I lose one of them? Having only one on a binocular isn't going to provide much benefit, is it? The EyeShields come with a lifetime warranty against damage or loss. You read it right — if a rubber EyeShield tears&sol;breaks, they'll replace it. If it falls off when you're in the field and you can't find it, they'll replace it. Even if a youngster visits you and flushes one down the toilet, they'll replace it. For a lifetime. What kind of warranty is that?! ?